Since its foundation in the ninth century Prague has punched way above its weight to become a fulcrum of European culture. The city s most illustrious figures in the fields of music, literature and film are well known: Mozart staged the premiere of his opera Don Giovanni here; in the early twentieth century Franz Kafka was at the forefront of the city’s intellectual life, while later writers such as Milan Kundera and film directors such as Milos Forman chronicled Prague’s fortunes under communism. Yet the city has a cultural heritage that runs far deeper than Kafka museums and Mozart-by-candlelight concerts. It encompasses the avant-garde punk group Plastic People of the Universe, the ‘new wave’ film directors of the 1960s who made their striking movies in the city’s famed Barrandov studios, and artists such as Alfons Mucha and Frantisek Kupka whose revolutionary canvases fomented Art Nouveau and abstract art at the dawn of the twentieth century. Beyond art galleries, concert halls and cinemas the history of Prague has been one of invasion and sometimes brutal oppression. The great German chancellor Otto von Bismarck once commented that ‘whoever controls Prague, controls mid-Europe’ and a succession of imperialist powers have taken this advice to heart, most recently Nazi Germany and the Soviet Union. Opposition has taken many forms, from the religious reformer Jan Hus in the fifteenth century to playwright and dissident Václav Havel, whose elevation to the Czechoslovak presidency in 1990 made him a symbol of the rebirth of democracy in Eastern Europe. 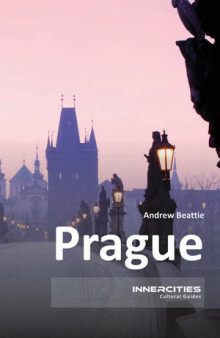 In this book Andrew Beattie also reflects on the modern city, where bold new buildings such as Frank Gehry’s ‘Dancing House’ rub shoulders with monuments from the Gothic and Baroque eras such as the Charles Bridge and St. Vitus’ Cathedral. He considers the suburbs too, home to world-renowned football and ice hockey teams, gleaming shopping centres and grim communist-era apartment blocks that are often home to Vietnamese, Romany and Muslim minority groups who live in a city with a growing international outlook. The Prague he reveals is an increasingly confident and diverse city of the new Europe. Andrew Beattie has written for Rough Guides and the journal Contemporary Review, and has contributed to programmes on BBC Radio 4. His previous titles for Signal Books include books on the Alps, the Danube and Cairo.